On Saturday I attended BlogHerFood 09 in San Francisco at the gorgeous St. Regis Hotel. I wish I got to stay there. But since I live about 25 minutes away, and I've only earned $1.09 from my blog. I couldn't cough up the $$$. BlogHerFood was a one-day event filled with seminars, food demonstrations, food to eat, food to look at, and lots and lots of bloggers. Some bloggers were invited to special dinners in Napa and SF. Not me. But maybe next time. Who knows. There were some true Food/Chef celebrities in attendance. Rocco DiSpirito was there. And Elizabeth Faulkner, of Citizen Cake was there! I'm sure you'll recognize her from Top Chef Masters or Iron Chef. I got a front row view of her making this crazy chocolate thing for Scharffenberger Chocolate. I'm going to blog about it tomorrow. I have to admit, I was completely overwhelmed most of the day. And I was not alone. A lot of bloggers knew each other. Many of us came alone and felt like very small fish in a very big, big pond of bloggers. Luckily, foodies are quite the friendly bunch, so I did meet a lot of people and learned some great things. One thing we all have in common is that our parents are our biggest fans. Here are some of the big "celeb" bloggers that impressed me. These bloggers have millions of eyeballs reading their recipes and looking at their photos. I do the happy dance if I get 50. Not that it matters. I'm just giving you some idea of how popular they are. Ree Drummond - A great lady that lives on a cattle ranch, home schools her four kids and blogs. Uh huh. So for everyone that says they're too busy......check out Pioneer Woman . David Lebovitz - A Californian, now living in Paris. Very funny. Sassy like me. 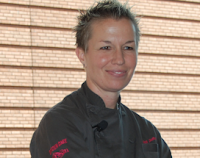 Helen Dujardin - a very funny french pastry chef. I can't wait to try her recipes. And she makes house calls! Her site is called Tartellete....on the sweet side of life. Amy Sherman - a seemingly regular gal, with a hugely popular blog called Cooking with Amy. She lives here in the Bay Area, gotta love that for sure. I did a bad job of taking pictures. Kath of Kath Eats Real Food did a great job. She already has them posted on her site. She was at my lunch table with Jenna Weber (Eat.Live.Run) and Danica Pike (Danica's Daily) and Jennifer Patterson (Unplanned Cooking) and a group from Cooking.com including Tracy Randall the President and Founder. We had a lively conversation about the food, wine and Rocco! So what did I learn? Real food bloggers are a hard working bunch. They create recipes all the time. Take fabulous pictures. Write cookbooks. Write recipes for big corporations. It's a full-time gig. Who knew? I learned lots of tips to improve your blog ranking, taking better pictures, how to write so people will read and respond/comment. I guess I need to decide where I want to go with this little project of mine. Or not.